On the back of their Bluesfest 2011 appearances, two of Reggae’s most famous and enduring acts will play sideshow performances in Sydney and Melbourne. Toots and the Maytals, one of the Greatest Jamaican Reggae artists EVER, will be joined by one of the most important reggae singers in decades Luciano and the Jah Messenjah Band together with rising star, Warrior King. First formed in Jamaica in the early 1960s, Grammy Award winners Toots and the Maytals have been spreading their unique combination of gospel, ska, soul and reggae around the world for more than 40 years. Toots and the Maytals were credited with coining the term ‘reggae’ when they released their hit single Do the Reggay in 1968. International recognition followed in the early 1970s with Monkey Man, Funky Kingston and Reggae Got Soul. The band’s iconic track Pressure Drop featured on the soundtrack to the 1972 film The Harder They Come, which introduced reggae to much of the world. With the release of his 1995 breakthrough album Where There Is Life, through to his 2010 release United States of Africa, Jamaica’s Luciano is regarded as one of the most important reggae singers in decades. The combination of accessible, positive lyrical themes and contemporary rhythms as well as his commitment to the true spirit of Jamaican reggae, has seen his followers dub him "The Messenger". Having toured Australia twice before and with 16 studio albums already to his name it is clear that irrespective of which genre the baritone sings, his message remains spiritual and cultural. Rising reggae artist Warrior King, burst onto the Jamaican music scene in 2001 with his debut album Virtuous Woman. With his vibrant and uplifting lyrics and addictive roots rhythms Warrior King now comes to Australia for the first time. wow, could they have made Warrior King's name any smaller? and who is Bonnie Casey? Since Toots inna di mix.......Mr Danger sent me this Doco made on Toots and The Maytals.......Big file but check it out forward!!!!!! Heard a quick interview with Warrior King on zipfm this morning talking about the Luci, Toots and WK tour of Europe and their upcoming Australia tour. He's such a humble guy! Actually think it's pretty good value. I mean Luciano on his own show would be $40ish, Warrior King (would probably never get a chance to see him with out a show like this) maybe $25-30ish and then the big man toots could probably command a $60 ticket price on his own. Appreciate it's a lot of money, hardly an 'unbelievable' price imo though. yeah, knowing how much these shows cost to put on - especially with full bands - this doesn't seem unreasonable to me. Toots and the band were AMAZING!! Saw all three of these at Blues fest. Warrior King was wicked! But he wrapped up too quick on 'Virtuous Woman' (seemed like 20 seconds of the tune). Maybe someone called 'time' on him coz he only had half an hour set. Luciano was same as last 2 times I,ve seen him. Good but a tad boring its got to be said. Also I missed the Meters coz I was locked into the reggae tent. oh well..
Toots was really good fun! Heaps of that 'call and response' thing that really got the crowd amped and involved. Played all the classics and The festival crowd was eating it up fully! At the Byron show he was just like a cruisy warm up act for the mayhem and destruction that Trooper provided. anyone know the running times for melbourne show? well what a night at the enmore theatre in sydney; boney casey outta canada kick tings off wid some nice vibes, then warrior king wid luciano band backing did all his big tunes and was wicked, luciano then burst on stage and did a classic set including its me again jah, one way ticket, sweep over my soul and many other early 90,s tunes,most tunes included extended dub versions, having first seen luciano in ja 93 he never disappoint. 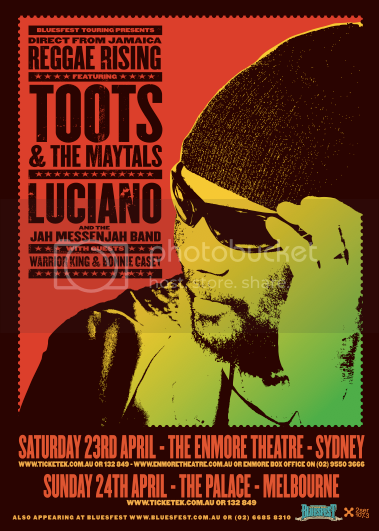 toots was good but had trouble with the sound, did all the hits, highlight was when luciano join toots on stage. top value night, melbourne massive get in early for warrior king.